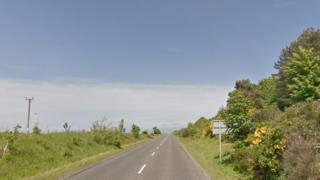 A motorcyclist is in a serious condition in hospital after a crash involving a camper van near Eyemouth. The accident happened at about 15:00 on Wednesday on the A1107. The 30-year-old rider of a black Yamaha MT motorbike suffered a serious leg injury in the collision with a white Mercedes Sprinter van. The injured man was airlifted to Edinburgh Royal Infirmary where he remains in a serious condition. The van driver was unhurt. The road was closed for three hours as initial investigations were carried out. Insp Richard Latto said: "This was a serious collision and we are eager to speak to anyone who may have information. "I would ask anyone who was on the A1107 near to Eyemouth around 15:00 on Wednesday, 8 March, and witnessed this collision, to get in touch with us as soon as possible."